PetsCELL – Mobile Phone For Dogs | OhGizmo! By Andrew Liszewski on 02/21/07 • Leave a comment! It seems you can sell anything to a pet owner if you can convince them it will improve the life of their animal. Don’t believe me? Well the fact that the company PetsMobility is selling a mobile phone designed specifically for dogs is all the proof you’ll ever need. It’s made to be worn on the animal’s collar so of course it doesn’t have any buttons for dialing but at the same time is still pretty functional. First off you can call your dog at anytime to assure them that even though you’ve abandoned them for several hours they’re still a good boy or girl. Or more likely you can warn them to get off the furniture. 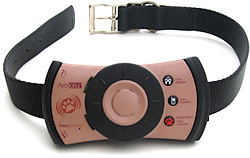 Secondly the latest version of the PetsCELL phone is GPS equipped which means if your companion goes missing you’ll be able to track their exact location (or at the least the location of the collar) through software on your PC. Thirdly the GPS capabilities also allow you to setup a virtual geo-fence boundary around your property and the collar will automatically alert you when the dog has stepped outside of that area. Not really effective for keeping the animal safe but at least you’ll know when they’ve left and where they’re headed.